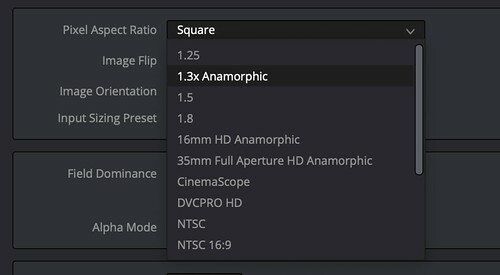 I'm pretty sure you can change aspect ratio in resolve. I did it for mv720 footage years ago. You probably did it the wrong way in Resolve. In the Sizing window, just type 3 for the "Width" and 1 for the "Height" setting. Resolve works with Non-DualISO 1x3 footage, converted with MLVFS, like a charm with your latest focus pixel map. For DualISO footage, I am afraid, MLVApp is your only option. I use MLVApp to convert it to ProRes and then grade in Resolve. Slow but works, with a few focus pixels left. i did a recent video in this mode on my 5d3 and i did indeed grade it in resolve. once i loaded the cdng files into resolve i set the project size to the desired resolution and then under "input scaling" i selected "stretch frame to all corners"
MLVApp saves the aspect ratio parameters into the cdng files. Somehow Resolve is not able to use it. Other applications do it. But there are possibilities to manually stretch it, as posted above. Bouncyball did the "dcraw" style pixel by modifying raw2dng code once. That should work too. Let's wake up mr B! @dfort: about the focus pixel issue: do you have some short test files for us? 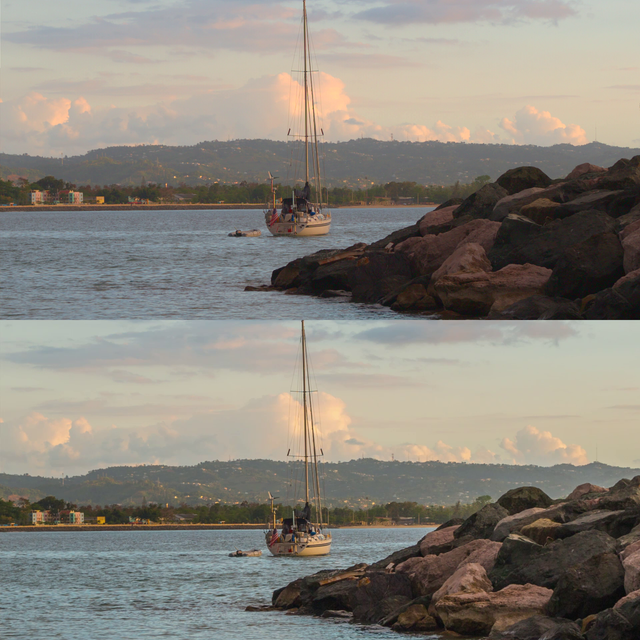 I posted a download link to such test samples on the previous page - two normal and two DualISO 1-frame MLVs. @IDA_ML: what's the problem with these clips? Here all focuspixel disappear when installing dforts maps. On some edges some single points stay there maybe... but not sure if any algorithm can interpolate such difficult points. But I would say 99% of the pixels are gone. From Dfort's post #2797 it is clearly seen that in DualISO files MLVApp does not clean the focus pixels completely. They are clearly seen over the mountain area of the frame as pink dots. In normal Non-DualISO files, these pixels are gone completely. @IDA_ML: When I tried today, non of those pixels were visible for the dual iso file on the mountain area. They are only visible if you don't install dforts maps. Really? Ok--it is either me doing it wrong or maybe you have a newer version? It worked fine for the regular file but not on the Dual ISO file. 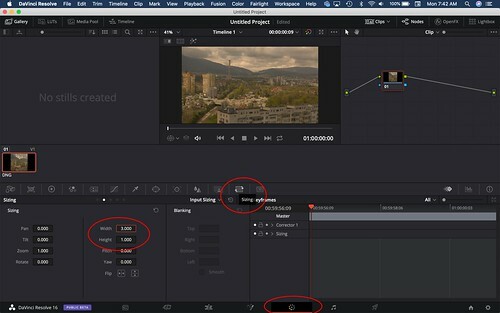 You probably did it the wrong way in Resolve. In the Sizing window, just type 3 for the "Width" and 1 for the "Height" setting. The issue I brought up was that Resolve isn't reading the metadata in the cdng files. Sure, you can resize it but that's an extra step that shouldn't be necessary. Well, skipping cdng tags is nothing new. Even adobe skips this tag in premiere. I checked everything again and it turned out, I hadnt copied the latest map into the MLVApp directory proprly. My fault, I appologize for that. I am using Resolve 15. Just checked. It opens and desqueezes a 1x3 Dual ISO files properly in the way I explained above. Not of much use though since Resolve does not convert Dual ISO files. What is also weird was that I was getting corrupted exported dng files then I launched MLV App this morning but after relaunching the app later in the day it worked fine. I am using Resolve 15. Just checked. It opens and desqueezes a 1x3 Dual ISO files properly in the way I explained above. I'm on Resolve studio 16 public beta. Yeah, I know--show off. I got a complimentary dongle from Blackmagic because I was testing out their products on a consulting gig. In the Sizing window, just type 3 for the "Width" and 1 for the "Height" setting. Where is the Sizing window you are talking about? Please show us. Not of much use though since Resolve does not convert Dual ISO files. What workflow are you using? You need to convert Dual ISO in MLV App before exporting the cdng files. True. Looks like the only way to get the right aspect ratio in Premiere is to do a dynamic link from After Effects. Either that or use a motion effect the same way as transform in Resolve. You could file a ticket to reolve about the cdng tag. Maybe they can get it to work. Even dcraw swallows this tag. Note that I have changed the Width setting in the red rechtangle from 1 to 3. It's a mouse click away. Don't worry about this additional step. You can also automatically apply it to all 1x3 clips. As far as my workflow is concerned, if I need to grade Dual ISO files in Resolve, I convert them and desqueeze them in MLVApp, export to ProRes, open them in Resolve and continue with grading there. Works great, even on my 7 year old laptop. Maybe, one day we will have GPU processing in MLVApp and this will speed up the process significantly. Maybe I should read the 2,739 page manual that came with Resolve before commenting on it again. 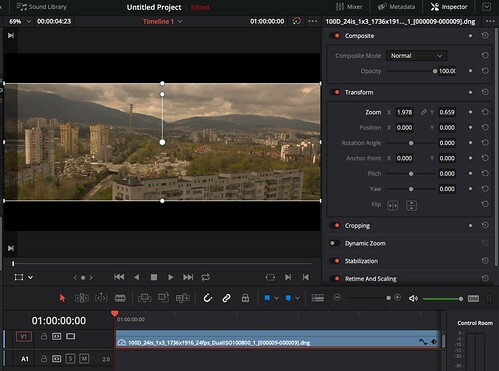 It would be much more interesting to get the guys at BM to implement DualISO conversion in the next version of Resolve just as our MLVApp developers did. Message to the MLV App developers: I believe there is a way to automatically check if an MLV is Dual ISO. It might slow down importing the files but it would be a nice feature. 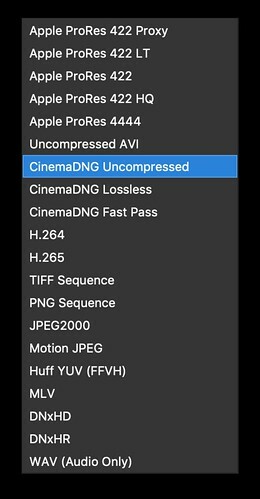 In any case, there's the option to export in uncompressed, lossless or lossy (fast pass) DNG format. These DNG files will have the focus pixels removed, converted Dual ISO and whatever else you want to do in MLV App saved in the output file. Now for the part that isn't making sense to me when working with DNG files. 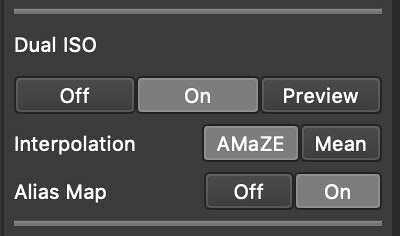 We can do all sorts of image manipulating in MLV App which is great when exporting any other file format but if you export to DNG these settings don't show up in other applications. Open a DNG file exported from MLV App in Adobe Camera Raw (ACR) and except for the aspect ratio setting we've been discussing, it looks like an un-manipulated file. Play with the settings in ACR and next time you open that DNG file in ACR you'll see that those settings were saved. Open the same file in Resolve and you're back to square one. What would be great is if the different software developers would use the metadata saved in DNG files so that whatever grade or image manipulation you made in one app will display properly on another app. That would also keep us from having to dig through menus, settings, adjust nodes, etc. just to apply a setting that is already set in the DNG file. Sorry for the rant. I know we have no control over other applications, especially closed source commercial apps but isn't there some sort of a standard that is supposed to be followed when working with DNG files? Seems like nobody is following these standards, not even Adobe and they invented DNG. I don't think they will ever do, as long as no blackmagic camera is able to record dualiso. Or are they able to record such files? We already use the auto check and only enable dualiso GUI elements if the current clip is dualiso. We decided not to enable dualiso itself automatically, because of speed reasons. This was just a dream. I am perfectly happy with how MLVApp handles DualISO files, especially now that Dfort's latest focus pixel maps work with such files so well too. Yes, rendering is pretty slow but for my amateur videos, it's perfectly OK. I don't have a problem leaving the PC render DualISO MLVs all night long and when I wake up in the morning, they are ready and waiting for me to edit, grade and mount my final video in Resolve. As far as Blackmagic are concerned, in my opinion, if they add direct MLV processing as a standard to Resolve, their sales will increase dramatically. Thousands of people worldwide use ML on a regular basis, so ML is changing the world. I agree, MLVFS is very fast and easy to use as it is, I use it all the time. But many people don't like that hassle and would prefer Resolve to open and work with MLV files directly. vid.stab seems to work very nicely @masc ! I was watching the demos and... damn. Yes, it works nicely. If someone likes to try it out: vid.stab for Win&OSX version is commited for testing, Linux is on the way in the next days. Works for FFmpeg export only! After this post I was thinking about MLVapp when saying there are better app for converting MLV, RAW and dual_iso MOV. What came to my mind is if MLVapp is scriptable? Since I have not a lot of interest in video making I will like to have some sort of auto conversion for MLV files, so to have a file that can be used without any color correction or editing, just a full batch auto conversion without any user input. card inserted "Image Capture App" recognizes ML card and start MLTools to move all the files on card to my working folder and convert what that need it. The working folder is monitored by LR autoimport and ML card get erased from imported files and unmounted when finished. My 600D can't do a lot of RAW video but I think I can use batch conversion for Timelapses with silent pic. 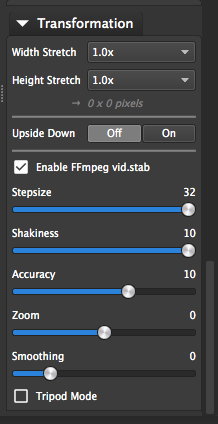 Vidstab (video stabilizer) is now commited for Win&Linux&OSX. Especially Linux made some problems. I hope I could solve it... please have a try if you can and report issues! The rocks on the one below, looks brighter because for me it was easier to grade with Shadow Adobe PS RAW slider. Maybe using the same equivalent slider withing ML App I can achieve the same result. 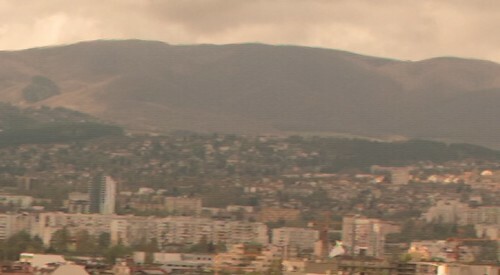 If it looks kind of noisy is because I filmed 1080p 1:1 for an 200mm equivalent from a 24-70mm Sigma Art. What MLV App does is the same as Adobe camera raw, it processes raw images, except straight from MLV instead of through DNG. But out of the comparison I like both results. The rocks are nice and contrasty in Adobe, but I think MLVApp version is more warm and "cinematic" (my fav word). Thanks for replying! So, grading both LOG would be more of a fair comparison regarding sharpness?